Introduction: "Die you pathetic monster!" returned to the owner's hand. Anaylsis: One of the most anticipated cards when this card came out. actually visually seeing what it does. Conclusion: Good card, HORRIBLE name. Effect: A monster equipped with this card cannot attack. 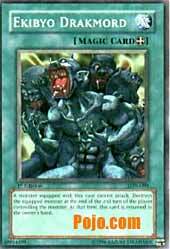 Destroys the equipped monster at the end of the 2nd turn of the player controlling the monster. At that time, this card is returned to the owner's hand. Is Ekibyo, and likewise Drakmord? I look at this card, and I go O_O. This can be one of the most annoying cards in the entire game. I mean, look at it, it has THREE effects! It prevents the equipped monster from attacking (it can still change its mode), it destroys it after two turns, and if the effect completely goes through, you even get it back! Yes, I realize that two turns is a short lifespan in this game, but it can shut down your opponent's Jinzo or Blue-Eyes or such if you can't destroy it normally. I don't know, a triple effect like this is hard to pass up, and with all the powerful Magic and (especially) Traps floating around, your opponent may not be willing to destroy this card. They'll just let its effect go through again and again. I would play this card in a quantity of 1, and perhaps run 1-2 in your side deck if you feel your opponent plays enough powerful monsters to warrant two or three of these. Have fun!